This listing is limited to the 17 carol which relate to Christmas. The source of the fifth carol is identified as Waldensian. The source of all other carols is identified as Corona dì Sacre Canzoni, 1689. In the listing below, the title appears first, the tune second, separated by a dash. I have included the full text of the Preface from Wood and Woodward. (i) Passo la notte buia (No. 21) and Questo nobil bambino (No. 22), both taken from an older book of Laude, printed in Rome, by Allesandro Gardano, in 1583; this collection is in the British Museum. (ii) A lieta vita (No. 29), by Gastoldi Da Caravaggio, 1591. (iii) Caro liet' amato dì (No. 5), found in a volume of sacred songs, from Upper Italy. The book was once in the possession of the late Mr. A. H. D. Pendergast. Concerning the Words. Wherever possible, the Editor of this, the English part of the work, gladly availed himself of the literary labours of Dr. John Mason Neale (see No. 37), and of the Rev. W. J. Blew (see No. 22): but in other cases he was compelled himself to provide words of his own; first, because these old Laude Spirituali were written in a great variety of ususual metres, abounding in double or feminine rimes, and sometimes also in Rima Sdrucciola 1; and secondly, because modern poets and versifiers seem to object to be tied down to a particular measure, especially where (to preserve the integrity of the original melody) trochaic and trisyllabic endings are absolutely necessary. In English, however, it is unfortunately not possible to reproduce the flow, and vocal sweetness, of the beautiful Italian language. According to Mr. E. J. Dent, in his paper on "The Laudi Spirituali of the xvith and xviith centuries" (delivered before the Musical Association on March 20th, 1917), the earliest collection of printed Laudi dates from 1563, one at Rome, edited by Animuccia, and another, coming from a Venetian press, by Razzi, a Dominican Monk of San Marco at Florence. In 1570, Animuccia edited a second volume of Laudi, and in 1577 a third book was published, and reprinted with slight variations in 1583; and again another volume appeared, edited by Soto. The three were reprinted in one volume in 1589, all the hymns being arranged for three voices. Two more volumes appeared in 1591 and 1598. Mr. Dent goes on to say: "Still more important as sources of secular Melodies are the various editions (1675, 1689 and 1710) of the Corona de sacre Canzoni, edited by Matteo Coferati, all published at Florence, but the Florentine collections give the tunes unharmonized." 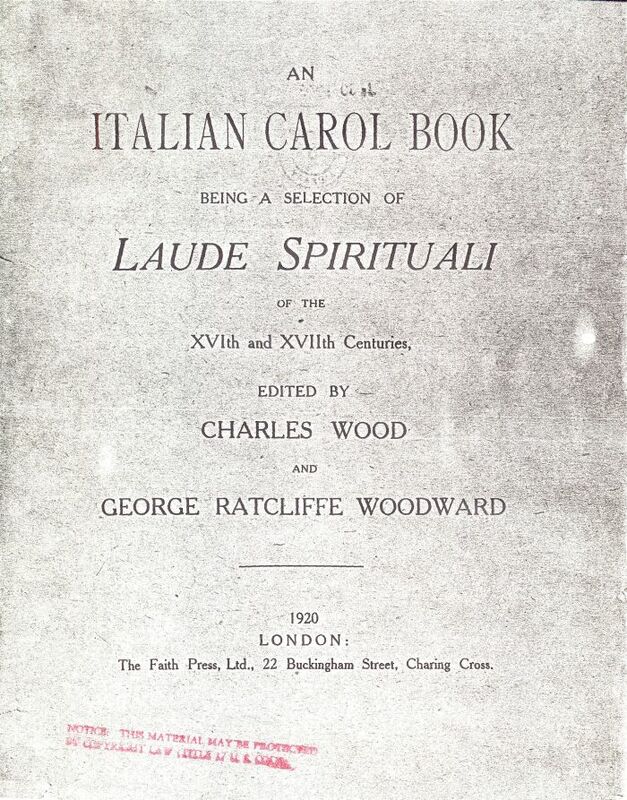 It may be mentioned that the copy of the 1689 edition (from which the present collection of Italian Carols set to English words is taken) was discovered and purchased by Mr. Woodward, some twenty years ago, in an old second-hand bookshop in Rome. It is not to be found in the British Museum at present. Andiam, compagni, alla rivièra (No. 30) is another form of the French Réveillez-vous, belle dormeuse (see Douen's Clément Marot et le Psautier Huguenot, Vol. I. p. 730), or perhaps the French borrows from the Italian. There is a strong family likeness between several of these Laudi Spirituali and the old tunes found in the Netherland, and in other-land, popular tune-books. Corrono, fuggono, volano i dì (No. 32) is evidently a variation of that which is said to be a Gascon Air, taken by Claude le Jeune as the bsis of his charming Madrigal, Debat la noste trill' en May (Paris, 1587). The melody of A lieta vita (No. 29), known to John Sebastian Bach as In dir ist Freude has found a place amongst his Organ Chorale-preludes. Where the chief melody has been assigned to the Tenor Part, it is recommended that the first verse of the Carol should always be sung with the melody in the Treble. In other verses, if desired, the Canto Fermo should be strongly brought out by all the Tenors or most of Basses, only a few Trebles and Altos singing the upper parts. The words of the Carol, Tother day in mid-winter (No. 16), are an English versification of a legend, recorded by St. Thomas of Cantipré, concerning a Cistercian Monk in Braband; for which see R. F. Littledale's Commentary on the Song of Songs, p. 213.